Using Windows 8? Windows 8.1 free upgrade is now available! Windows 8. Love it or hate it, it’s what you can expect to be using if you buy a new PC these days. Microsoft stirred up more controversy with its latest operating system than anything in recent memory by completely changing the familiar Start button based interface we’ve come to love over the last 18-or-so years. In its place is a screen full of bright colors and big tiles, and with Windows 8.1 Microsoft’s flashy new OS is getting its first facelift. Overall, the changes are minor, but bring some much-needed options and tweaks to make Windows 8 more comfortable. A free “service pack” for users of Windows 8 that introduces bug fixes, options requested by users, and a few new features. 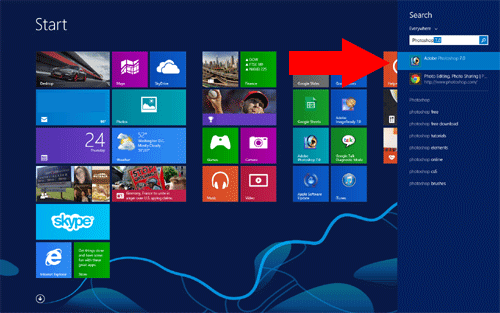 When Windows 8.1 boots, you probably won’t notice many differences right away. The “Metro” screen is still full of tiles, and the desktop looks like the same desktop you had before you installed the upgrade. Your “Charms” bar still shows up when you move your mouse to one of the right corners of your screen, except now it positions itself towards the top or bottom depending on which corner you use to open it. You can also resize, move, and group tiles easily on the Metro screen, but other than that, it pretty much looks identical. Return of the Start Button! Hello old friend! Due to popular demand, the Start Button is back. If you click on the new Start button, it simply returns you to the Metro tile screen, so Metro tiles are your new Start menu (as was originally intended, but poorly executed). You can also right-click on the button to get a list of common Windows controls, such as Programs and Features, Power Options, Task Manager, and more. This is becoming one of my favorite features of Windows 8.1: the “Omnisearch Tool” allows you to start typing while on the Metro screen, and it will find anything you want. If you haven’t used it, try it! Just type (no window needed), and a search window will appear, showing you relevant information. Can’t find an app? Just type the title and it appears. Want to do a web search for giraffes? Type “giraffes” and check out your options. I’m finding myself using Omnisearch more and more. Microsoft gets it…the Metro tile screen isn’t everyone’s cup of tea. If you’d rather be in Desktop land when you start up your computer, a simple checkbox solves all your problems. From the Metro screen, type “Taskbar and Navigation” (See? That Omnitool is awesome! ), open “Taskbar and Navagation” icon, and a settings window will appear. Click the Navigation tab, then checkmark Go to the desktop instead of Start when I sign in, and click OK. From that point on, anytime you start your computer, it will to right to your beloved desktop. This is one of those “it doesn’t look like it matters, but it does” features. When the Metro screen has the same background as your desktop, it makes your experience feel more connected–you’re no longer switching screens, you’re simply bringing up options. It’s minor, but I suggest giving it a try. 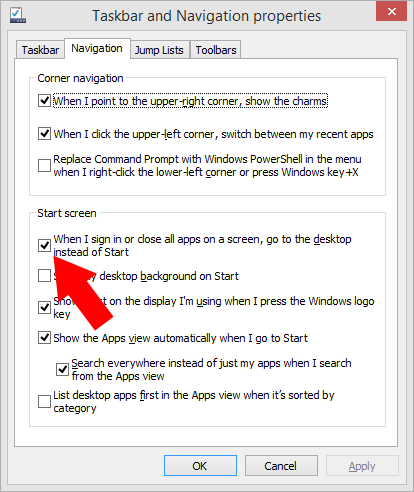 Go to the Taskbar and Navigation properties (as mentioned above), and checkmark the “Display desktop background on Start”. If you right-click on a tile, you now get options to resize the tile to your preference, and you can put tiles into locked groups. 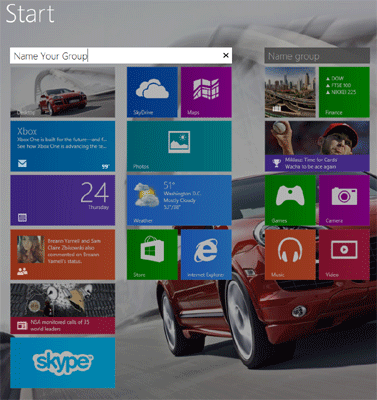 Groups prevent tiles from being spread into a sprawling mess as in the last version. You’re then able to freely move tiles around inside the groups. Windows 8.1 is essentially a tweak for Windows 8. It fixes some of the inconsistencies an annoyances that plagued the operating system’s initial release, and adds some things that users requested. I like these enhancements, as it finally makes Windows feel completely usable without the need for add-ons for the first time since I started using it. The Omnisearch additions are fantastic, and the new organizational features of tiles helps keep things organized and easy to find. While this new version catered to the “old-schoolers” by allowing you to boot to the desktop, it’s obvious that the majority of Microsoft’s attention is going to go toward the Metro screen from now on. More and more apps are appearing in the App Store to replace your desktop applications, so expect your work environment to transition in the coming years. Metro tiles still haven’t grown on me, as working on the Metro screen seems confining…like I should be able to do more things at once than I’m actually allowed to do. It has a tablet mentality to it that, at the moment, is still a bit clumsy and cumbersome for desktop or laptop use. Windows 8.1 is available as a free upgrade for current Windows 8 users from the Microsoft Apps Store. Be warned that it is a 3.3GB download, so if you’re on a limited data connection, you’ll want to use an alternate Internet connection to install. Previous Previous post: Is your iPhone or iPad having trouble with Wi-Fi connections? iOS 7 may be to blame.